you know CATNIPblog was inspired by and dedicated to Peggy’s cat Maui who lived to show us the brain CAN be “rewired” and healing IS possible. 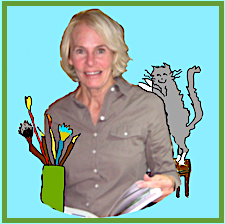 Peggy wrote and illustrated this children’s book for her grand-daughter Lucy. Lucy loved the story and illustrations! With encouragement from family and friends Peggy published the book on Amazon and Kindle.